Sahana Thirumazhusai's project will explore the evolution of communities within former conflict zones. In the modern world, conflict arises all over the globe due to various divides. Thirumazhusai believes that understanding how the communities were affected will provide new discoveries and improved ways on how the communities can rebuild. She plans to study real-world examples, conduct analyses and examine art, literature, grassroots efforts and tourism. Thirumazhusai will use both historical analysis and cultural interpretation of present-day affairs to learn how things have changed in the communities over time. She hopes that the result of this work will provide new insights into the fundamentals of how communities change and heal after conflict as well as insight into what may be preventing it. 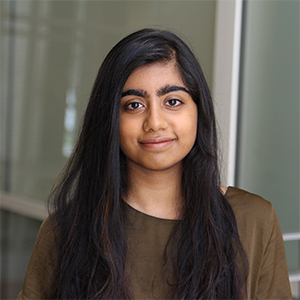 Thirumazhusai's social and political history major has allowed her to collect primary source narratives, study conflict and political analysis and explore historical conflict around the world. During her junior year and while taking "Art, Conflict and Technology in Northern Ireland, he had the opportunity to travel to Northern Ireland to gain first-hand knowledge of the conflict and its effect on the community.